Can you bring a family to a Padres game on a budget? The answer is yes... but you'd better have a big budget. Game are not cheap, but there are ways you can go to the ballpark and save a few bucks. First, choose your game wisely. The Padres use a "dynamic pricing" plan where the more popular the game the more the fans will pay. So a Friday night game against the Dodgers will cost more than a Wednesday night game agains the Pirates. 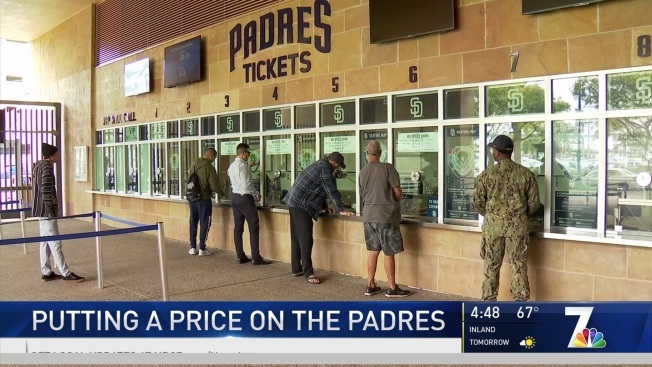 "If you wait till the day of the game and come out and buy a ticket for that day, you are going to pay a little bit more," said Padres President of Business Operations Erik Greupner. The same seat will cost more based on popularity. The way to avoid the same day increase is to buy one of the Season Ticket packages or buy single tickets ahead of time. The Padres do offer discounts at various times for military, first responders and families. There are also group discounts and the Park at the Park with seating on hill beyond right field. Greupner says they have no plans to raise the base ticket price this season but that will change in the future. "Until we're playing winning baseball," said Greupner, "we are not going to raise season ticket prices." Food prices can also impact a family budget. Greupner says in some areas food prices will go up and stay flat in other areas. But he says a hot dog will cost a little more than last year. The Padres have a policy that allows families to bring food and drink to a game but there are restrictions, you can read them on the Padres' website. And while no one want to pay higher prices, a competitive team costs more and has created higher demadn for those tickets. According the StubHub, sales are up 44% compared to this time last year.